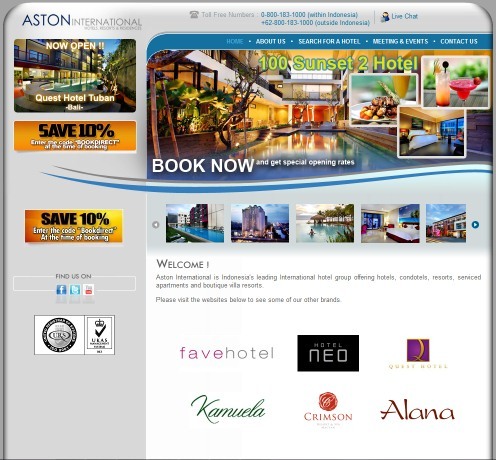 Jakarta, July 13th, 2012 – Archipelago International (the management company of Aston, Kamuela, Quest, Neo and Fave hotels) proudly announces the availability of 24/7 reservations through email, fax, phone and even live chat, in order to meet the demands of our customer requirements. Archipelago International entered Southeast Asia over a decade ago and has since become a prominent international player in the Indonesian hotel market, with offices in Bali, Jakarta and Surabaya. Archipelago properties currently operate in Indonesia, Malaysia and the Philippines under the five-star Grand Aston and Crimson, deluxe villa Royal Kamuela and Kamuela, four-star Aston, three star Quest and Neo , boutique budget class Neo hotels and select service favehotel labels.